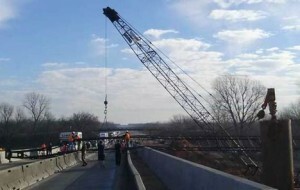 A lattice crane boom came down onto I-44/The Turner Turnpike near Stroud, Oklahoma – halfway between Oklahoma City and Tulsa- on Saturday. According to local feedback the incident was caused by a boom pendant cable failure to a crane working on a turnpike bridge. The boom was quickly removed from the road by another crane working on the same site. No one was injured in the incident, although a truck on the road sustained some damage.